Pushcart Coffee opened up in the Gramercy area (on the northeast corner of 21st St and 2nd Ave) not too long ago, and it's a really great neighborhood coffee shop, that places importance on the local community. It's also a nice little cafe--not overly-crowded, but often quite busy. They occasionally host events like writers' groups and musical performances. While I'd stopped in for tea or coffee occasionally (they offer soy, almond, or coconut milk at all of their locations), I'd never tried any of their food until last week. 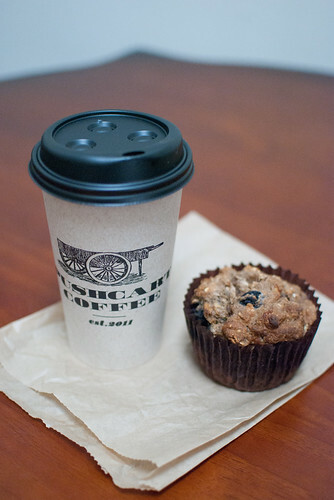 As I perused the pastries, a vegan muffin stood out to me. I decided to give it a try, and I was glad that I did! I'm always hesitant about places that only serve a few vegan baked goods; I'm often so disappointed at how dry or dense they can be when not properly executed. Not the case here! This was a very hearty muffin--packed with oats and fresh blueberries, and a good amount of banana, which gives it a moist, thick texture that's hearty but not overly heavy. They also introduced a vegan noodle and herb soup a few weeks ago! If you're ever in the neighborhood, I'd definitely stop on by and check it out! They also have a location in Chelsea, on West 25th St (between 9th and 10th Ave).